G is laying next to me falling asleep, seemingly completely unaware of the “milestone” he reached today. I think that is because as his parents, WE want moments like this to reflect back on, and see the progression. WE want “milestones”. WE want to hit our goals on a standard timeline created by all the people before us, right or wrong, regardless of who our individual child is. As for G, well he doesn’t. This kid just goes out and works. Every. Damn. Day. So needless to say, regardless of the “milestone” thing (whatever that is to each of us), I have decided to reflect on our journey. G began therapy when he wasn’t even 2 years old. He will be 6 at the end of September. I can still completely and clearly remember the massive bag of mixed emotions we felt, as we entered into the world of Autism. G couldn’t speak a word to us until he was almost 2 and a half. (And yes, there is no way we can express how greatful we are that our boy could speak so early, and can now speak so well). G didn’t play with toys (still not really his thing at all! ), didn’t interact with peers, couldn’t dress himself, couldn’t tell us his emotions, didn’t have enough hand strength to even write a visible line on paper until he was almost 4. We are an unbelievably, crazy lucky family. And do you know why? Because of G… G… was the hungriest, of the hungry caterpillars. No doubt he needed a nudge. No doubt he needed a team. No doubt, he was hungry as hell. In addition, do you have any idea the amount of amazing people that have already given there time, and energy, and compassion, and patience, and hope, and LOVE to our little man? From Allison, to Mary Lou, to Heather, to Nichole, to Jillian, Erin, Jennifer, Lisa, Kristine, Ms. Poupore, Ms. Spoor, Ms. Wilkins, Ms. Storms, Ms. Lavalley, Ms. T., Ms. Isecke, Mr. K., Mr. Dosiek, Ms. Allen, Buddy, Emily, and Ms. Brindisi. Heather. You have been with him, and us, longer than anyone. And although I’m sure a public thank you was never necessary… it is something that we would really like to do. Thank you, Heather. Thank you for everything. You know… you know what we are talking about… all the extra stuff that goes along with it all. Thank you for truly caring about our family, we hope you can feel the big hug we are giving you! Ms. Poupore. You saw his strengths, and his potential. You set the bar high, and you helped to make sure he achieved it. I’m willing to bet you loved having him around (who cares if we are partial! ), yet you still pushed him out of your room, as fast as you could, because it was what was best for him. We also would like to give you a huge digital hug, to say thank you for everything you have done. So with all the thanks we are so lucky to give, we still have one thing left to focus on. Yeah… you guessed it… it’s our little G man. Our hungry little caterpillar, has been eating up ALL of the wonderful tools, and skills, and love that ALL of you have been feeding him. You all helped to create a massive cocoon of warmth, and security, and growth, around our G man. 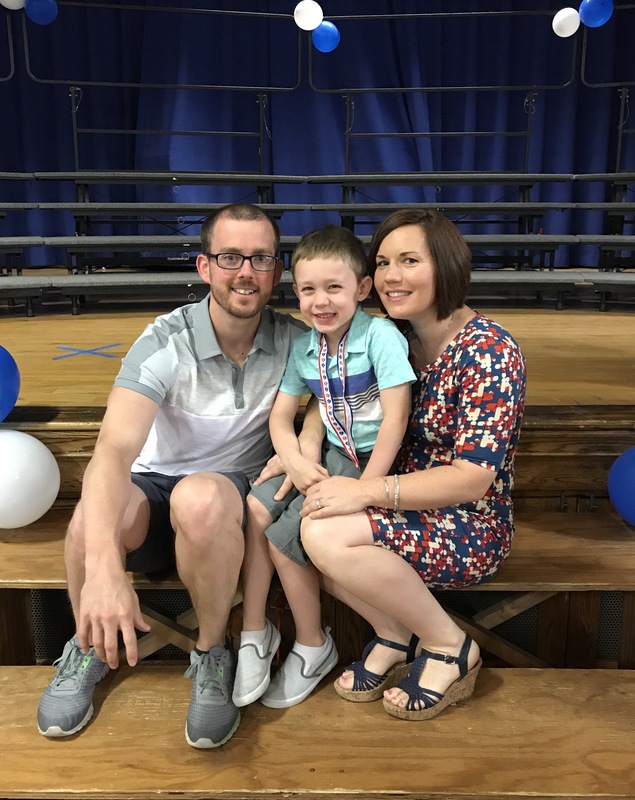 And today… he graduated from Kindergarten. He will be moving into 1st grade with no aide on the bus, and no aide in the classroom. He broke out of his cocoon, and turned into the most BEAUTIFUL butterfly. And my God… was it ever beautiful. He walked so proudly on that stage today… he walked right up to that microphone (they were saying their own names) … and said so clearly and loudly… “Greyson “Goose” Fleury”! Then he walked over, received his medal, shook the principals hand, took a bow, and sat down with the other kids. I guess regardless of how we want it to be, it was still an awesome thing to watch, and an even awesome’r, thing to feel. 😜. So to anyone reading who knows G, thank you for knowing him, as always. Previous G is for growth. Next You down with IEP? Yeah you know me!